1 Rinse and wash the grapes well. Drain and pat dry. The grapes should be fairly dry before freezing. 2 Place on a cookie sheet in 1/2-cup (125-mL) clusters (1 serving)or as loose grapes. 3 Place the cookie sheet in the freezer. Freeze. 4 Serve the frozen grapes alone or with Sunshine Fruit Dip (see below). 1 Mix all the ingredients in a bowl until well blended. 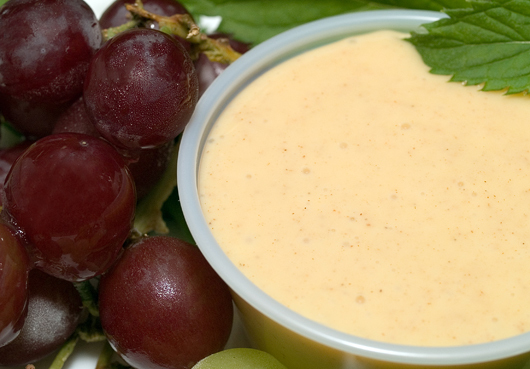 2 Chill and serve as a dip with frozen grapes or with any fruit of your choice. Tip: Frozen grapes are a great healthy treat to replace sugary Popsicles and ice cream treats. They have a wonderful, almost candy-like texture. Even picky kids enjoy them. The darker grapes are very sweet. Grapes come in many varieties, but there are two main types: wine grapes, used for juice and wine production, and table grapes, intended for consumption while they are fresh. All table grapes are picked by hand. Fresh table grapes come in three basic colours: green (sometimes called white), red, and blue-black. Black grapes are dried to make raisins, and white grapes are dried to make sultanas. Table grapes are a good source of potassium, vitamin C, and phytochemicals. Phytochemicals and antioxidants play an important role in reducing the risk of many cancers and heart disease.